Well, someone responded to a post of mine saying that the e28 instrument cluster was the same as the e24. So based on that, I bought an e28 instrument cluster figuring that I could scavenge it for parts to make my cluster work. Well it arrived today and I can tell you that although from the front it looks similar, the way it mounts and the way that the temp and fuel gauge is mounted is VERY different from the e24. It's not going to be an easy swap. $100 wasted. So I broke down and bought the Programa batteryless SI board off of Amazon. Since my original gauges are showing signs of life, I figured it was the SI. Ive spent enough time and money trying to track this darn thing down. This e28 PC board does not look remotely like my e24 board. I don't think we are talking about an easy swap here. From the front, the e28 cluster sure looks similar to the e24. In fact, I think the speedo may be swappable, but the tach and other gauges are not. This will be parted out on eBay. So I thought I bought an aftermarket SI board that was battery less. Opening the box, I saw that it was a board that had Lithium batteries! That was unexpected. It was also mounted in the white plastic back of the Instrument cluster housing. Again, unexpected. I took a picture of my old board and compared it with the new one. They look to be a good match. It's too late to try this board out tonight, but I am SO looking forward to getting this in my car and finally having working instruments. Please! I'll have to wait for the weekend. New board and old board side by side. All the bits look correct, I just didn't expect the battery! It's under the orange sticker. The new board came pre-mounted on the white plastic of the instrument housing. Nice. This doesn't look like an aftermarket part. It's made in Germany and marked BMW. Hmm.. So I also order some speakers to replace the ones that are in sorry shape and also the original speakers in the car. I decided to stay true to the brand. The original was Blaupunkt so I also got new Blaupunkt speakers. I have to say the new speakers look fabulous. I even like the sinister looking grill. The odd thing? The original speakers were made in West Germany. Oh well, hope they sound good. I finally got time to put these in the kickpanels. I couldn't use the cool looking grills as they got in the way of both the hood latch lever and the glove compartment door on the passenger side. So I an using these without grilles. It's a good thing they still look good. Note, that they barely fit. On the drivers side they sit quite snugly. On the passenger side, I couldn't get the top portion to site flat. It seems like the magnet is hitting something in the fender. However, I got a screw in there enough to secure the speaker and the glove compartment hides the top portion. So I just left it. I tried out the speakers with the factory stereo and they do sound much better. Although all I had before was static so it's not a great comparison. I really like the new speakers. I hope they sound as good as they look. Last edited by songzunhuang on Sun Sep 27, 2015 3:00 pm, edited 1 time in total. Song, where are you going to . . .
Re: Song, where are you going to . . .
Those speakers under the seat seems a good idea. So far my plan is just to replace what's there. I have the whimpy factory pods, not the deluxe ones. The speakers in my picture are actually 4x6. It's just the grille that's making them look big. I test fitted them this morning and they actually work for the kick panels. I have another set for the rear speaker pods. I've got a power antenna and a new Kenwood head unit coming. I tried to stick with Blaupunkt but their head units got mediocre reviews. The Kenwood I got is a Media Player. There's no cassette or CD so it's really shallow depth. It's also got the requisite iPod interface and Bluetooth for hands free. I was careful to be sure the color of the lights would match the rest of the interior. I had considered refurbishing the factory radio, but it's just too far gone. Technology has gotten so much better. Damn the SI Board is ANNOYING! I installed my new BMW SI Board this morning. You'd think all would be good right? Of course not. There are so many weird things going on. I'm a bit frustrated. The temperature gauge has sprung back to life. It appears to be registering the right temp and behaving as expected. The fuel gauge didn't work at first, but then when I pressed the odometer reset (yeah makes no sense), it sprung back to life. I went to the gas station and filled up the car, but the gauge reads 3/4 tank. So kinda good and bad. I replaced the bulb for the "D" gear indicator and I now have a "D" Light. I'll post some pictures of this later. My previously working speedometer now only goes to 40mph. I got on the freeway and used my GPS to register moving at 70mph, but my speedo only says 40mph. It used to work fine! Odometer - nothing. It would work intermittently before the new board, but now it's not doing anything at all. Tachometer - used to work pretty accurately, but now only goes to 2000 rpm. When I am idling, it shows 0. This used to work just fine as well. Service light - there are now 4 green lights. They are on or are flashing wildly. At idle they are just on. When I drive, they flash. What's up with that? Economy gauge - it dances around. I could be at a steady state and it'll bounce between infinity (far left) and 35mph. I can floor it and it'll only goto 35 or so. It won't go to the right for some reason. Brake lining - never saw this light before. Now it's on all the time. Does anyone have any ideas about this? Thanks in advance. After my last post, I thought I should look into reasons why my instrument were whacky and I came across an article about resetting the SI computer. Hmm, perhaps a "reboot" would do the trick. So I got a piece of ground wire from an electrical conduit and I used it to ground pin #7 in the service port. I did both resets. Ground for 3 seconds to reset oil service. Ground for 12 seconds to reset service interval. Afterwards, I took the car out for an extended drive. Even my economy gauge appears to be acting reasonable well. The only thing that is still broken is the odometer. I may take the speedo out and re-flow the solder as I have heard that this can fix things. For now, I am going to enjoy having instruments while I drive. After week, I'll be prepared to take all this on again. So moral of the story, after the SI computer replacement, be sure and reset the SI. Here's what it looked like as I reset the SI by using conduit on pin 7. Last edited by songzunhuang on Sun Sep 27, 2015 3:19 pm, edited 1 time in total. So many posts I've seen say that the "D" light on the gear indicator was toast. Mine was gone too. It's the light that stays on most of the time, so it's no surprise that it burns out. Here's a few pictures and process for how I fixed mine It's pretty easy and it used a standard 2721 Osram 12V 1.2a bulb. Same bulb as a lot of the instrument and dash lights. It's only a $1.50 part. First order of business is to get the plastic mounting piece off of the PC board. Mine is secured by 3 plastic posts that were melted flat into place. The melting process secured the pieces. I used my hobby soldering iron with a wood cutting tip to melt and push the plastic to reform a post. After all 3 posts were reformed, a screwdriver is needed to separate the PC board from the plastic mounting piece. There is thankfully no glue used in this process. Second was to desolder the bad bulb. Just for kicks, I used a multi-tester to check continuity on all the other bulbs. I also hooked up a battery to each bulb to make sure they would glow. It also verified that the "D" bulb was a gonner. TO remove the bulb, I used a desoldering braid. It was quite effective at getting the old solder off the board. You put the braid on the joint and heat it up. Once it's to the right temperature, the solder liquifies and gets sucked up by the braid. It's easy and leaves a clean surface. Next step is to get the replacement bulb and bend the leads out so that it'll fit in the holes. once in, bend it 90 degrees to match the other bulbs. I then turned it over and used the plastic mounting piece to hold the bulb in place while I re-soldered the leads of the light bulb. After re-soldering, I verified the continuity with my multi-tester. Finally, I reattached the plastic, melted the plastic posts on to secure, and then re-installed the piece. I'm glad to report that I once again have a "D" light when I am in that gear. Here's the layout as I get ready to tackle the &quot;D&quot; light bulb in my gear selector. Here's the PCB after I used the de-soldering braid. You can see it's left a clean surface. In case you can't tell, it's the 2nd from the left. Re-soldering done. You can see in this picture how i used the plastic housing to keep the bulb in place while I did the repair. I discovered rust bubbles on the driver side rear quarter panel. I didn't have time for a full repair, but I didn't want to leave it. So I spent a few hours quickly grinding out the rust and doing a "emergency" repair that will hold for now. Not my best work, but I have other things to tend to. Primer coat in place in preparation for final. Grind out the rust and used some plastic filler to smooth out the holes. Quick color coat and clear coat. It's not perfect, but it'll hold for now until I get a chance to fully sort it out. At least it'll stop the rusting for a while. So I have put about 135 miles on the car in the past 3 work days. Magically, the SI board woes got a lot better as I drove it. Seriously, the last 70 miles EVERYTHING appeared to be working. The odometer, economy gauge, speedo, tach, temp - well, the yellow and 3 red lights are on in the SI. May have to perform a reset again I guess. Last weekend I took out the passenger seat and repaired a few leather seams. That was a learning experience. Also, I have this fuel smell and then my Brake Lining light is on. Then also my Brake light in the cluster flashes on every once in a while. I'm just going to systematically track things down. I've been doing a lot of work on this car, but have been posting various questions in the proper areas of the forum. So I've not been keeping everything here. However, I wanted to post a picture of the car in the parking lot of the train station where I leave her when I catch my commuter train to work. Parked in a nice roomy spot in the train station parking lot. She's served me well thus far. Wanted to get some pictures from this past weekend's work. I decided to fix separating seams on the passenger seat. Removing the seat was pretty easy and I was delighted that the leather cover was held on by some bendable tabs. I didn't have to remove staples or some other painful exercise. I got a Speed Awl for the sewing. It took a while to get used to it, but I'm pretty good at it now. The first seam was rough, but the second one I got down. I reinstalled the seat and took a few pictures. Then, I was excited that I finally got all of my instrument and dash lights going. This includes the "D" light of the gear indicator, the radio, the On Board Computer, the Defrost symbol and I upgraded the instrument light to a 5W unit. I think the dash is coming along well. All of the instruments and other lighting is coming together. I am especially psyc'd about the radio and the OBC. Here's the seat after the repairs. The seam on the bottom cushion of the passenger seat was repaired. The seam closest to the door was my 2nd effort. The one close to the console was my first. It's not so good. The is the sewing awl in action. It takes a bit of getting used to, but I got the hang of it. During the operation, it looks rude. The backing cloth material is practically disintegrating. The leather has held up well though. I'll never get all this done! Wow, stuff has been arriving at the house all week. I replaced the Brake Reservoir cap this morning. I have so much to accomplish this weekend. Here's a quick list and picture. 1. BMW high pressure fuel hose. Replace the CSV hose and other fuel lines. 2. New hood struts. Mine are not so good anymore. 3. Fuel Filter. 5 year old gas and 2 tanks later. It's time. 4. Power antenna. Mine is completely messed up. Replacing the whole thing. 5. Kenwood Media receiver. Bluetooth, handsfree, iPpd control. Cool. 6. Blaupunkt speakers. I replaced kick panels already. These are for rear. 7. Rear and Front brake pads. 8. Brake lining wear sensors. I don't know if a day will be enough. We will see. The parts just keep on coming. I am going to have to put a hold on the buying for a while. Good work, seems you're going gangbusters. Just be sure you're going to like that modern head unit in your dash. Also you may find the factory stereo wiring not as you would expect. If so search on here as plenty of info on this. jps635 wrote: Good work, seems you're going gangbusters. Just be sure you're going to like that modern head unit in your dash. Also you may find the factory stereo wiring not as you would expect. If so search on here as plenty of info on this. The media receiver has configurable colors. I can get a red or orange to match the OBC LED or the orange to match the rest of the dash. I picked this one because of the color match and because it doesn't light up like a freaking light show with weird animations and such. I've already looked at the factory wiring when I was in there to clean out the dead rat...another story. There's that weird fader control that I am not sure about. I called Crutchfield (where I got the stereo) and they said it wouldn't be an issue, but I am not so sure. I'll be sure and document as I go. Pretty simple with color match and no light show. Hopefully it'll look ok. I read your list & I certainly hope you go fuel line first, brakes next? GripGreg wrote: I read your list & I certainly hope you go fuel line first, brakes next? The fuel line will be done day 1. I don't know if it'll be first though because from everything I read, it'll wear me out. I figured I will do a few things for an easy win - power antenna tops the list - and then when I'm feeling good about things, I'll attack the fuel line. After that I'll probably just want to goto sleep. Ha! In any case, I won't drive the car again until after the fuel line is all done. So I needed a replacement antenna and I got a URO unit that was $50 and seemed like it would work. The was the second unit I got. The first had a hardwired antenna that wasn't going to work. I wanted to reuse the original antenna wire with a screw in connector. What was cool was that the factory harness was a female connector that just needed some male blades. I was able to solder on the blades and then just slide the connectors together. It was a very clean install. Also, the angle of the mount worked out well. I have included a close up of the mount area on the car. So, one thing done! On to the "Little perisher". Installed antenna mounts quite well. It was adaptable for angle so I got a great fit. This was the 30 degree adaptor. These are the male blade connectors that I soldered onto the wire. It was simple to slide them into the factory harness for the antenna. This is a side by side of the factory Hirschmann antenna and the URO replacement I got. There's a reason why it's 1/3 the price! However, I am happy to report the reception is quite good. After reading the nightmare of replacing this line, I wasn't looking forward to this job. I am happy to say that I was pleasantly surprised that I pulled it off in about 30 minutes. My hands are not that small, but I was able to reach under the intake and get to the screw clamp on the hose attached to the CSV (Cold Start Valve). It wasn't as hard as I expected! Now, when I removed the clamp from the top portion, I could see why the hose had failed. It was split in a way that appeared like it had been neatly cut. It was odd. The hose was just full of cracks and basically useless. Well, now I have a new hose. BTW - I found on this forum a thread calling this hose the "Little Perisher". It's location subjects it to a very harsh environment and it dies often. The fact that most people find it difficult to replace, made it infamous. This is how I got to the clamp on the CSV hose that was under the intake. It was tight, but I didn't have a huge problem doing this. Here's the whole hose out of the car. It's not too long, but it's certainly formed. I actually replaced it with a standard BMW fuel hose. The one I used wasn't formed. After removing the top clamp for the hose, it was clear how bad a shape it was in. In this picture the hose is removed and you can see fuel just gushing out of the injector rail. So I was excited to get to this one! Right before I installed the media player, I replaced my hood struts, but that's a relatively easy job and a bit boring! The Kenwood media player worked out well. After hooking up all the wires as marked, I had a great working system complete with a Bluetooth handsfree phone and iPod control. I changed the color of the display to match that of the car. This installation only uses the left and right channels of the receiver. The factory fader wheel below the radio still works fine. About the only weird thing is that the plastic is so shiny! 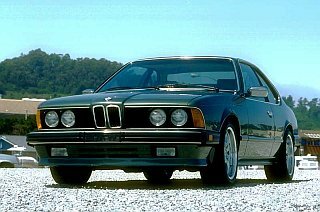 The original BMW version was more matte. I liked that. Oh well, I have great tunes. But all is not well in electrical land. Something has gone awry and my fuse #23 is blown. This means no rear lights, license plate lights or instrument lights. Sign, something I'll have to deal with more tomorrow. Also after this I attacked my brake pads and sensors. unfortunately, I only did one wheel and then it was getting dark. It fits well and the color is right. It's a bit shiny though. I love that it's got a USB port for iPod control and it charges my phone! This part is always a little scary. It's like deep electronic surgery. In the end it mostly worked, except for a blown fuse I have to track down the cause for. Epic Weekend for the 633! Well, it's Sunday night and I got a LOT done on the car. I think it's actually far enough along to be my daily driver now. Here's a short list of what I was able to get done. 1) CSV Fuel line that was causing the gas smell and wetness on the block. 2) New fuel filter - fixed the buzzing of the overworked fuel pump. 3) New fuel lines from fuel pump, to filter to fuel line. 4) All brake pads front and rear. The old fronts weren't too bad though. 5) Wear sensors - got rid of that "Brake Lining" light on the dash. 6) Driver's power headrest - I pounded the cable to get 1/4" more length. 7) Driver's power backrest recliner. No more twisty seat. New Kenwood Media player. Fixed circuit killing my #23 fuse. 12) Rubberized undercoating in several areas. It was a heck of a long weekend, but feels good that just about everything in the car is working now! #6 above was the MOST satisfying fix ever. I got to pound on a cable with a hammer and that actually made it work! Felt great. Next on the target list will be the rear deck with the speaker pods. I put new speakers but they are just laying there. The screws holding the pods are rusted in place. The backing material in the passenger side is destroyed where the hinge connects. Need to do some research on this one. The &quot;red&quot; color selection matches the glow of the console backlights quite well. The Kenwood Media player doesn't look too out of place on the dash. New fuel filter and lines fixed the buzzing I hear din the car. It was probably the fuel pump working overtime because of the old clogged filter. TIP: mark the date and mileage with a Sharpie on the fuel filter and air filter. sansouci wrote: TIP: mark the date and mileage with a Sharpie on the fuel filter and air filter. I actually store all my maintenance information for all my cars in my computer. I have it sync'd to my smartphone for easy reference. However, I like your idea. There's been many times when I wondered and had to go run a search on the phone. It would be easier if it were just in my face while I was looking at the part! Driving this car is a freaking light show! SI computer has one yellow and 3 red lights. Brake lining still flashes on and off intermittently even after pads and sensor. Tonight, the coolant light flashes followed by the yellow triangle on the dash. I drove the 25 or so miles home before checking it out. Well, my water pump pulley has worn a hole through the lower radiator hose where it comes out of the thermostat housing. WTF? I ordered a new OEM hose, a silly metal bracket that keeps the hose off the pulley. My car did NOT have this in place. Who designs a car with that kind of clearance? Just the expanding hose was enough to make contact with the pulley! Crap. At least I made it home ok even after driving 15 miles AFTER the light came on. I thought it was a slow leak and it was a very cool night so I wasn't worried so much. I didn't expect a freaking rubbed through hole! Didn't get as much done this weekend as my speaker pod repair turned into a long ordeal.It all started when I discovered that the bolts holding the pod to the hinge were so rusted that I had to cut them off and drill them out. During that process my hinge came out of the rear deck as the fiberboard it was attached to broke off. After I got it out, I had to drill out the old bolts and re-tap the threads. Then can the run to the hardware store for some new stainless steel bolt. No more rusting please. Then came the process of gluing on the foam back onto the metal form. I had heard Gorilla glue was the way to go. OK, let's give it a shot. The trick is the proper way to keep the foam on the metal as the glue sets. I tried 3 different methods and then settled on rubber bands. It wasn't without making a big glue mess. First I tried high strength masking tape. This was the stuff supposedly used with masonry. Well, it was a big fail. It kept coming off and the glue would seep out. Second, I used clamps. It kind of worked, but the clamps would also pop off at the slightest movement. IT also added to the mess. Finally, I used rubber bands. Lots of rubber bands. This worked well! I now know that I should just start using bands and they will hold. The dents they make in the foam will sone out after a bit of time and heat from the sun. Note that all three methods above were performed under significant duress and pressure as the working time for the glue was 20 minutes. I'm sure glad I had a big bag of rubber bands in the house! After getting this done, I installed my new speaker (using stainless steel nuts) and put it all back in the car. Now I know how to do my other speaker pod next weekend. However, I also know to reserve lots of time for cutting off bolts, re-tapping, etc. etc. Someday I will have to remove the entire deck and repair the underlying damage done. But for now, I'm leaving it. All done, the pod looks a lot better. I Think I have a sight alignment problem, but it still looks 100% better than before. I wasn't kidding when I said it was going to take a lot of rubber bands. I know now just to get a big bag and go for it. Liberal use of Gorilla Glue. It'll all expand and turn a yellow color. That expansion will also help fill in the gaps. I didn't expect to be drilling and tapping the mounts. This took way longer and was way more annoying than expected. I've decided that it's unavoidable. I need to replace the brake bomb. I saw this tool on Amazon and ordered it. I'm hoping that this will allow me to perform the Bomb change using the "easy" method that in another post. I think this will allow me to remove the Bomb directly. We will see.